In February 2016, Uganda had an election that left the country so estranged. There was a huge divide during and after the elections. When it was time for the announcement of who had won – there was a lot of discontentment. No one believed each other. The Civil society organisations believed it was the worst election ever. They did not at all believe the Electoral Commission’s results. To them – it was a mess and fraudulent. The same applies to the government. They were so sure that they had done their best with the given circumstances. The Opposition led by the Forum for Democratic Change did not want to go to court to contest the results because they had no faith in the Judiciary to deliver a favorable verdict. The FDC candidate : Dr Col Kizza Besigye in November 2015 said that he would not be going to court if the elections were rigged. To him, the rigging meant that he would not win the election. This was something that he had said in 2011.He had no faith in the Electoral Commission, and the Judiciary. On the people’s side – very many did not believe that the Electoral Commission of Uganda gave the right results. Especially the Civil society organisations in the governance sector that were involved in the elections. The list goes on and on- the issues of trust between government institutions and the citizens are so many in Uganda. On the regional scene: I have interfaced with the African Union a number of times. I had the opportunity to be at the last Heads of State summit in Addis Ababa, earlier this year. But every time that I meet fellow young people the thoughts are that : the African Union is a club of dictators, others will say that the AU does nothing. There are also so many who are disgruntled with the UN system. Its a club of snobs they say. Or its a club where people go to get rich and all. So many sentiments shared all showing the lack of trust that people have with government and multi-lateral institutions. So when the UN new Sec General spoke at World Government Summit and talked the lack of confidence in global multi -lateral institutions, I knew that I was in the right place. Because Yes, there is a trust deficit that we need to address. In his remarks he was very specific about the dangers of this loss of trust and faith between the 7 billion people on the continent and the institutions that were created to govern/advance their cause. And this is primarily we think very little of these organisations. They have not demonstrated to us their capacity to solve issues that are at the heart of humanity. But for this, he had a very definite solution: Reforms. “There is a need also for deep reforms in global institutions.” He said. “Reform at country level, reform in way countries deal to each other and the way international organizations operate, reform in our multilateral governance system development system are crucial to re-establishing trust. 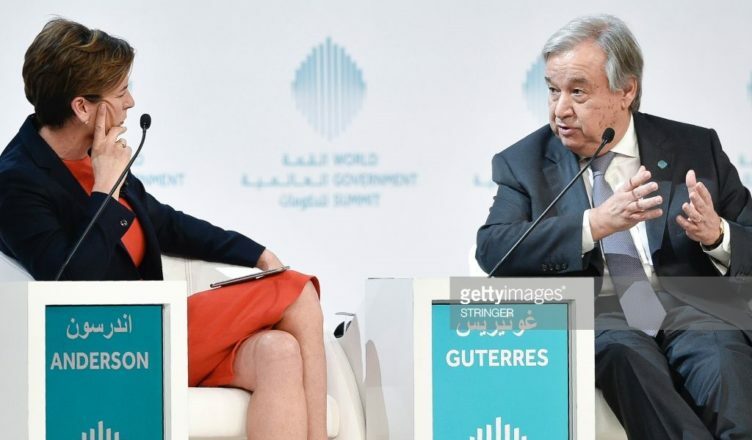 And without trust and I don’t think we will be able to address the very difficult challenges that we face today.” Antonio Guterres went on to say. A look at the OECD Recommendation on Digital Government Strategies which was one of the Reports on display at the World Government Summit – there are a few solutions mentioned in how governments can close the gap between institutions and the people. And one key point is the use of ICTs. The recommendations come from extensive research and work by the countries in OECD countries. The use and integration of ICTs in public institutions especially governments means improvement of government accountability, social inclusiveness and partnerships. It also means creating a data-driven culture in the public sector as well as coherent coherent use of digital technologies across policy areas and levels of government. We have all come to see and learn that ICTs narrow the trust deficit especially if they are used efficiently in public institutions. There are so many tried and tested methods that we have seen at work. Rwanda’s government is a great example. The idea of Innovation and the use of ICTs and STIs in governance to me continues to be a novel one especially as we look to rebuild trust in all institutions. We now need to get to work! Ruth, this article has been spot on. In Uganda and Africa at large the trust between governments, institutions and the citizens doesn’t exit. You have actually reminded me of the internet shut down in the just concluded elections. We had to use VPNs. I had a Windows phone then which was not compatible with tunnel Bear . I had to look for a compatible VPN. From the global political trends I honestly don’t think this African “trust” issue will be resolved any time soon. But that doesn’t stop us from trying. Nice article. May thanks for taking time to jot down your thoughts. Now that we know – we can only try.